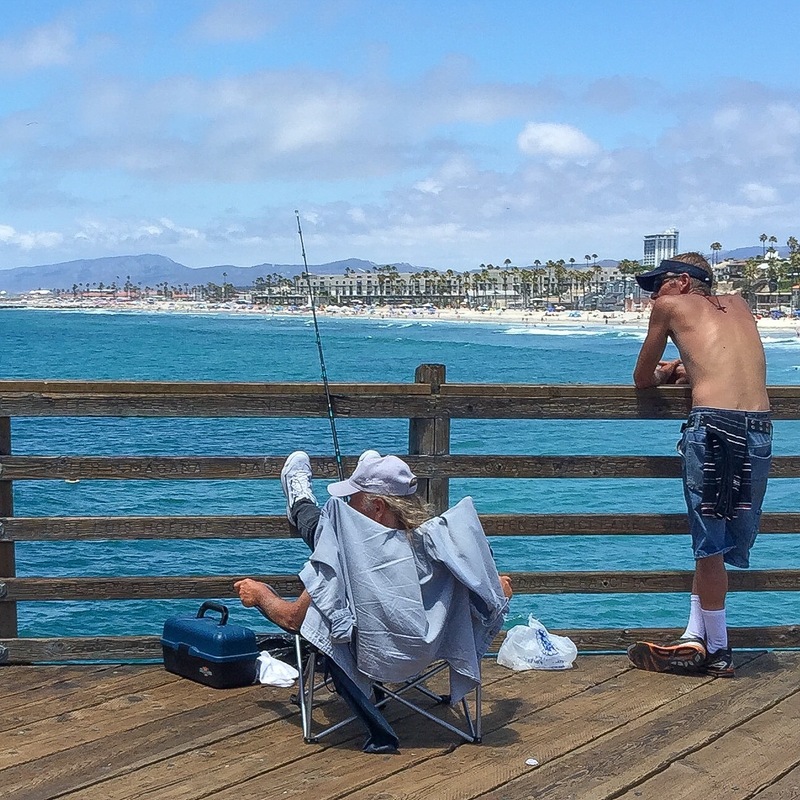 The first Oceanside Pier opened in 1888. 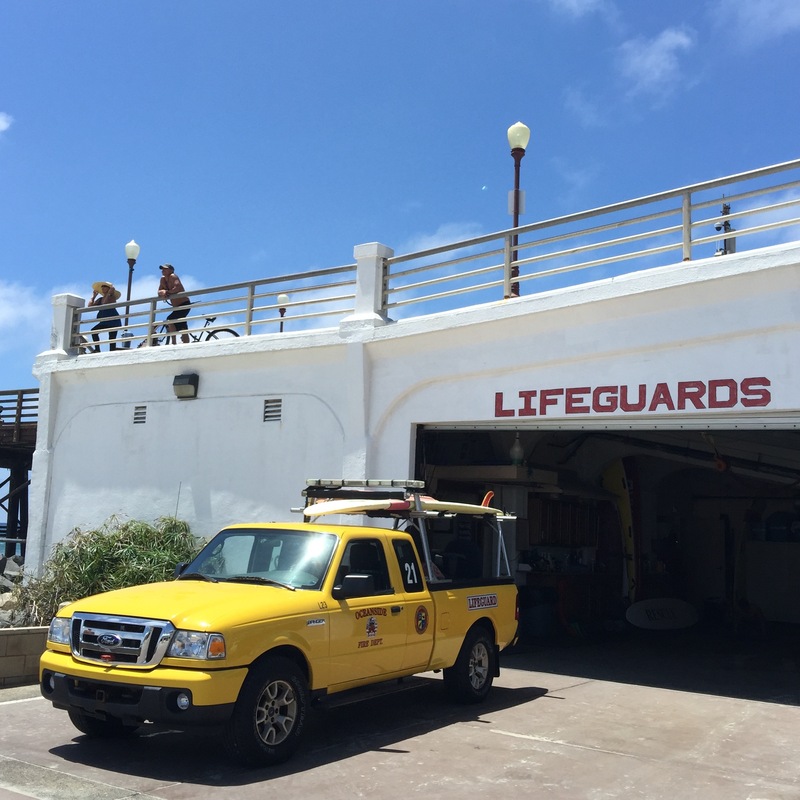 It was rebuilt in 1987, and my husband and I moved here in 1988—coincidentally, the hundredth anniversary year of the opening of the original pier. 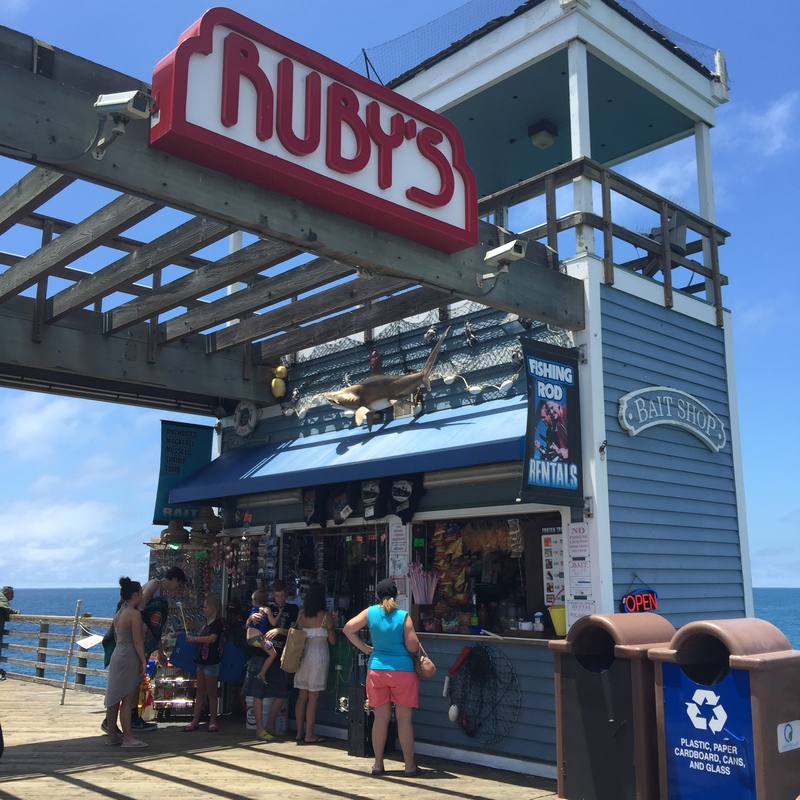 I worked at the newly opened upscale Fisherman’s Restaurant at the end of the pier until I got my first contracted teaching position in Oceanside. The seafood restaurant eventually failed. Ruby’s Diner took over and has been busy since the day it opened. The pier is one of the longest on the West Coast, and when I worked there I walked from our rental a few blocks away to the end of the pier and back several days a week. At the time, a golf cart shuttle was available to take people out to the restaurant. Apparently, couples dressed up for a romantic evening out didn’t want to walk the distance, and women in heals had a hard time navigating the wooden planks. This could be one of the many reasons why a steak and seafood place didn’t do well in spite of the beautiful location. 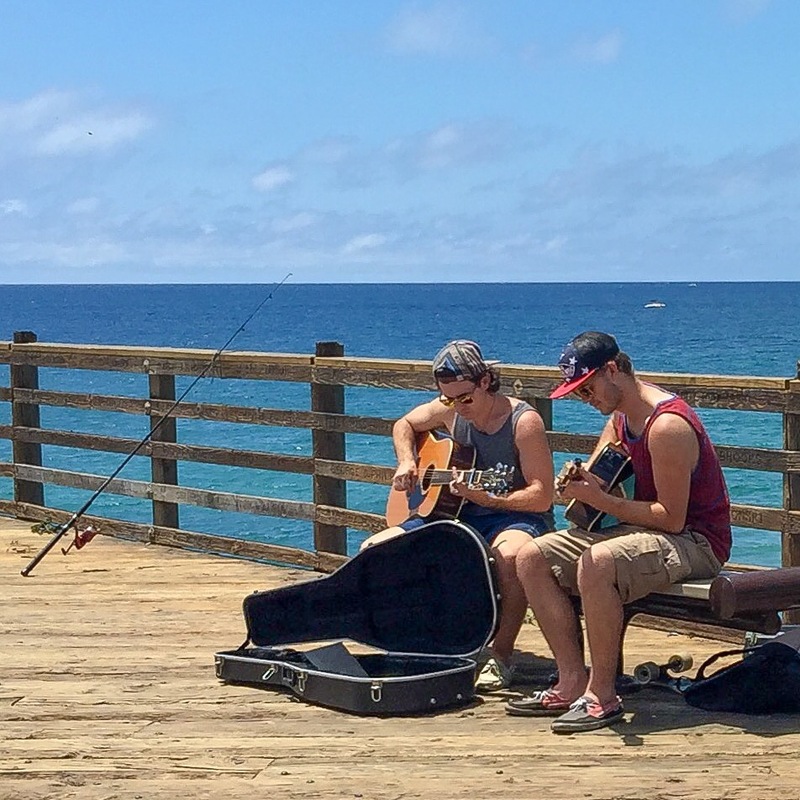 Oceanside was a rough and tumble town, but the downtown area has improved. Contemporary condos and quaint row homes have been built, and expensive hotels and farm-to-table restaurants have revived previously run-down neighborhoods, However, it is still a marvelously gritty place where people from all walks of life live and visit. I don’t do it often anymore, but I still enjoy walking the length of the pier. The beach is beautiful, the sunsets are spectacular, and there always seems to be something interesting happening. Today it was evident that preparations were underway for a weekend surf contest. 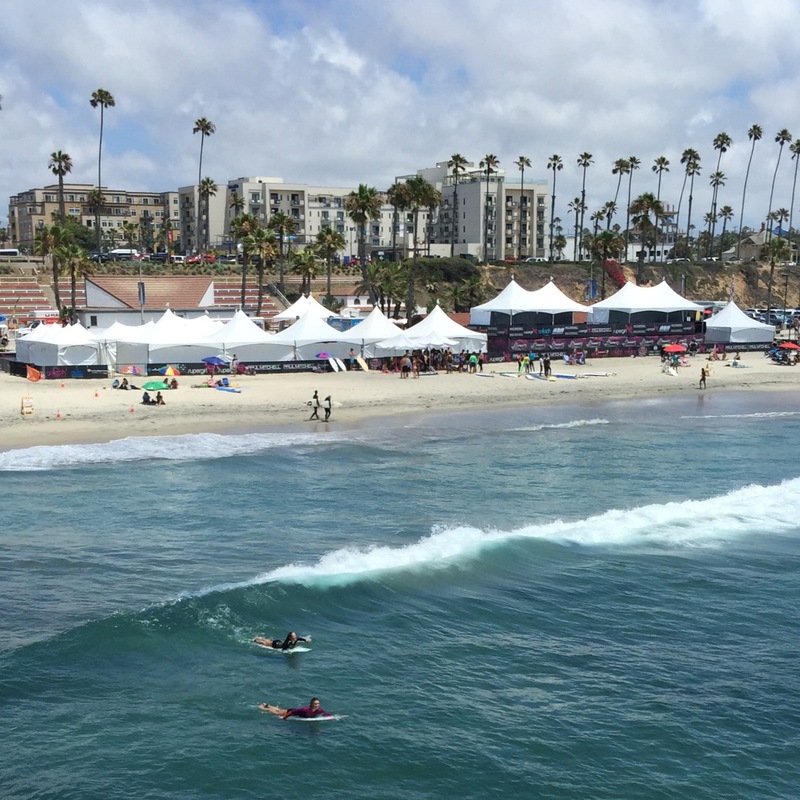 Tents were going up and sound equipment was being checked, but the local flavor of the area was not overshadowed by the excitement of the international surfing community. As I walked, I reflected on everyone enjoying the pier, the beach, and the water. 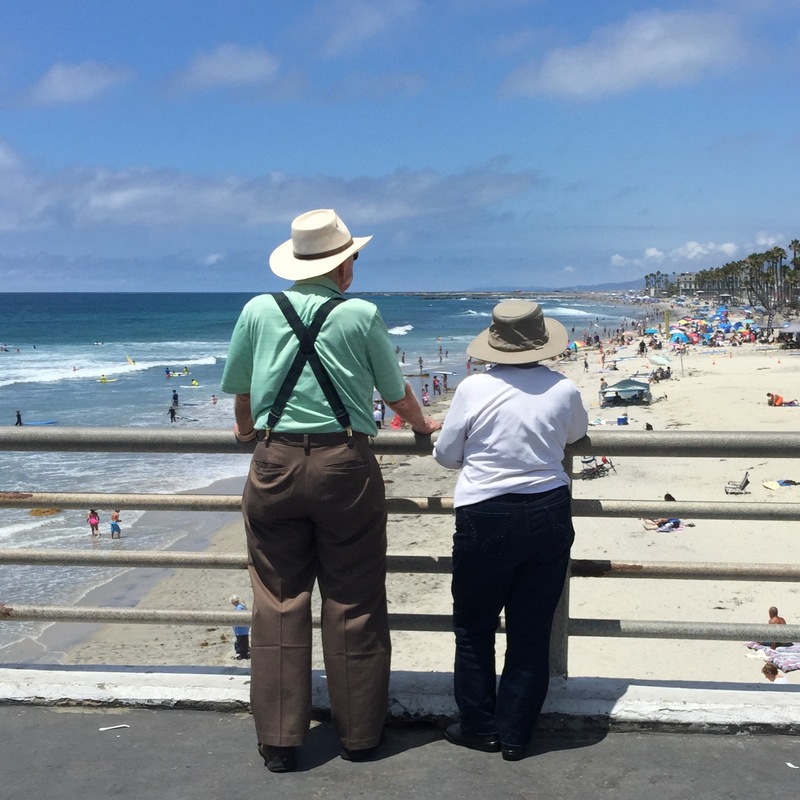 I noticed the diversity of people (one of my favorite things about Oceanside), and I started wondering about their individual lives. 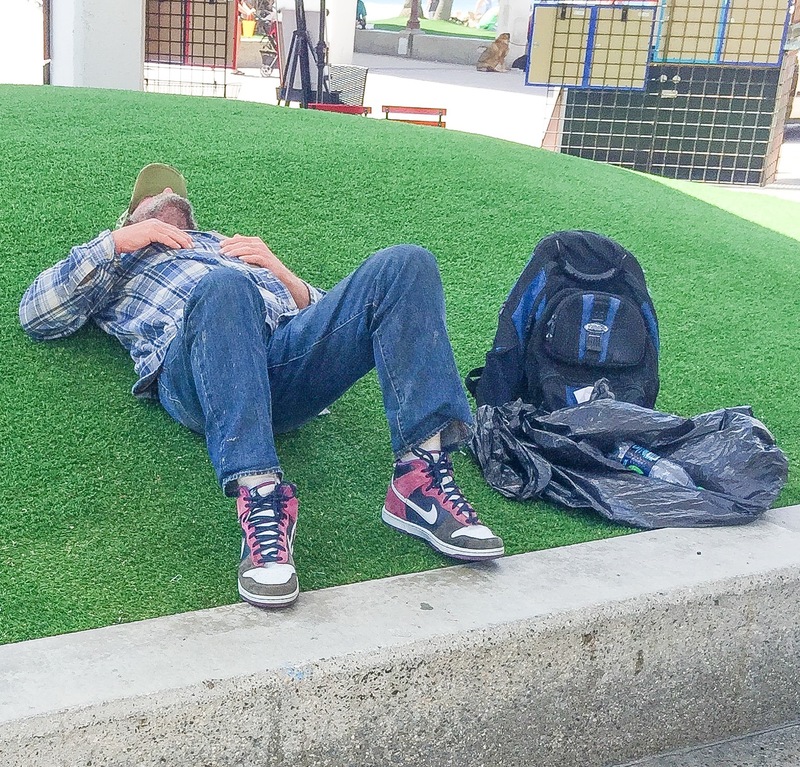 How did the man resting on the artificial turf in the shade beneath the pier come to be homeless? Does his family know where he is? Does he even have family? 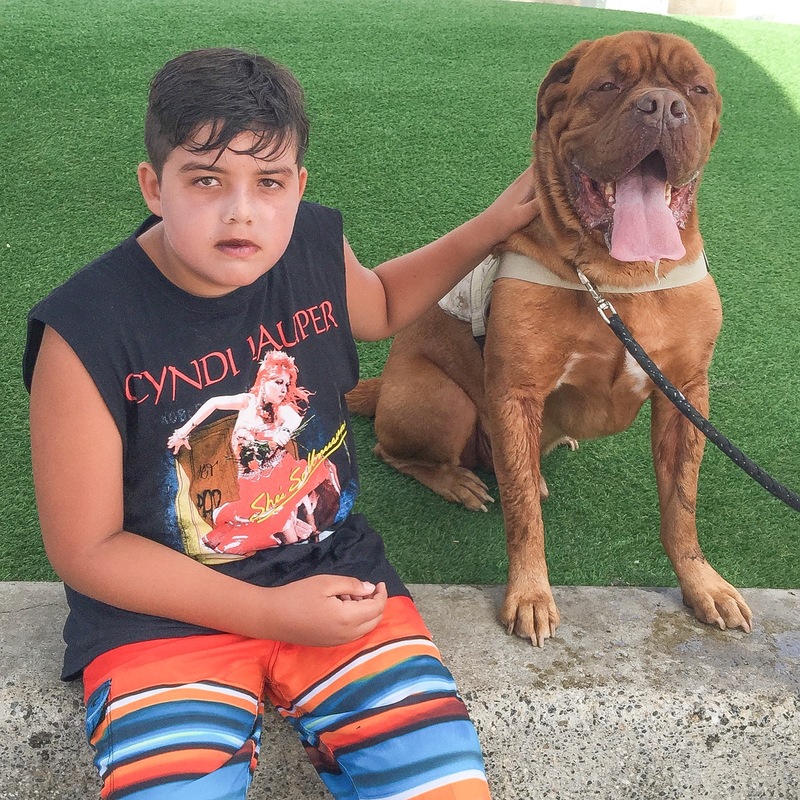 When I asked a man with a gigantic Bull Mastiff if I could take a picture of his dog and his son, he said, “Sure,” but he also corrected me by telling me that the boy was not his son. I apologized for my mistake and looked around for the boy’s parents. I couldn’t figure out who the boy was with and worried about the fact that he seemed to be unsupervised. 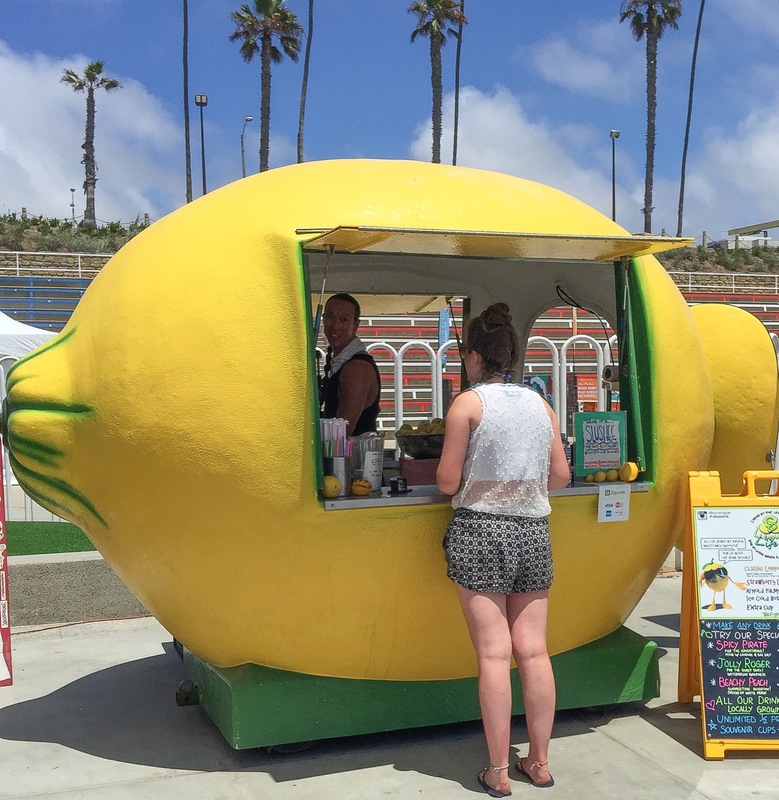 As I headed down the strand, I noticed a vintage-looking lemonade stand. A woman was placing her order at the window, and I was curious to know if she was with the group of pro surfers in town for the competition. 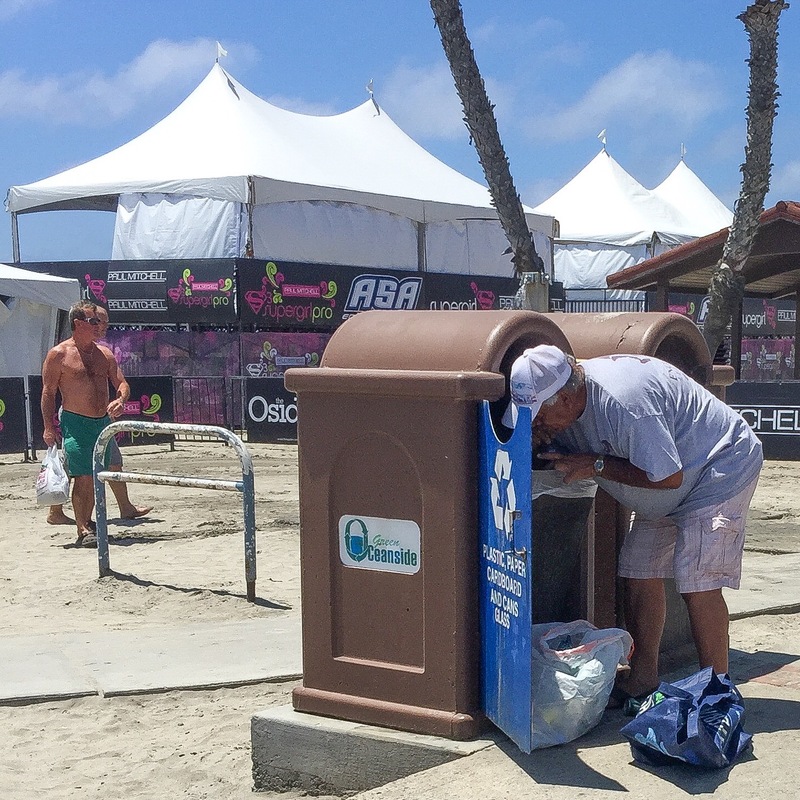 When I noticed a man picking bottles and cans out of a trash bin, I hoped that he wasn’t trying to support himself or his family by recycling them. 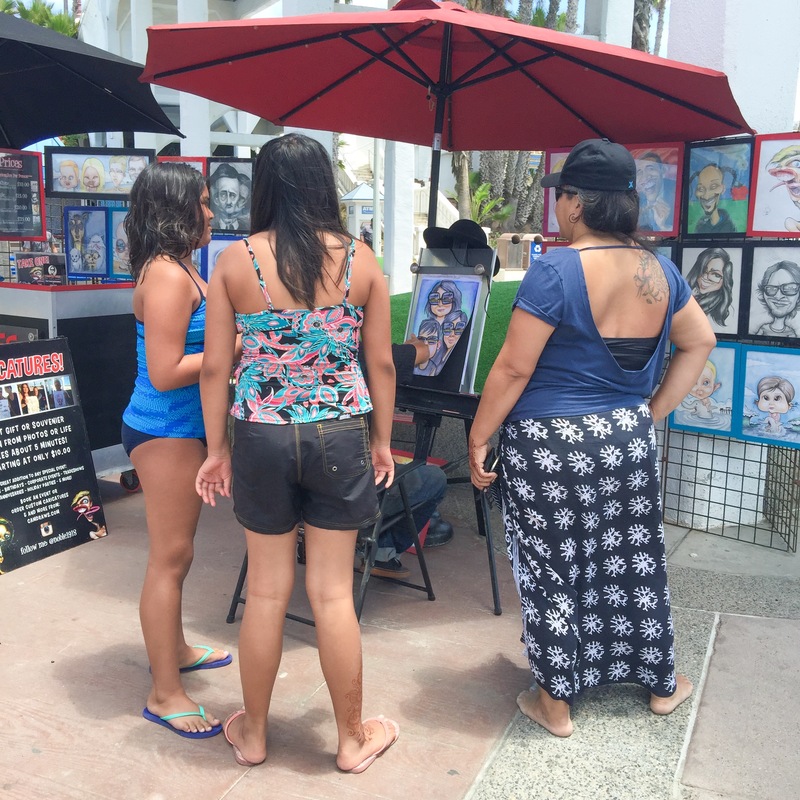 Then I saw a group of girls gathered around someone doing a caricature. They were giggling at the drawing and seemed close enough to be sisters. They were still standing together as I headed up the steep ramp to the pier. As I reached the top, I noticed an elderly couple enjoying the view—and the cool breeze. Their hats shaded their faces, and the man was wearing suspenders to keep his pants up. I wondered if they were Arizona desert-birds who headed to the coast to escape the heat. 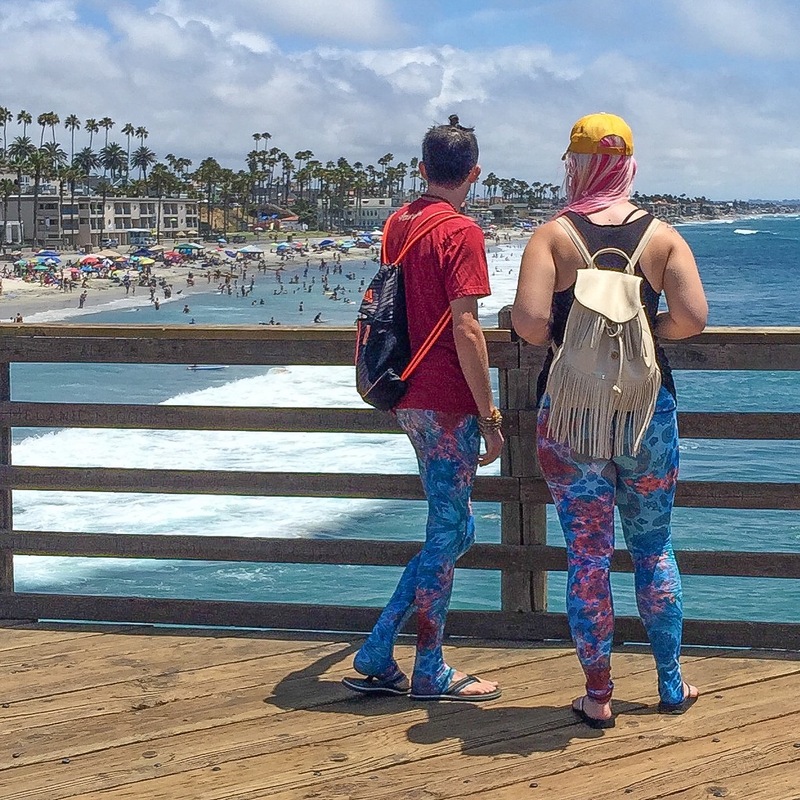 Further along, a young couple dressed in matching leggings appeared to be watching the surfers. Her colorful hair stood out against the sky. Just past where they stood, two musicians sat on a bench playing their guitars. An open case indicated that they were accepting donations. I wondered if they needed the money or if they were just playing for fun and practice. People were lined up to fish on both sides of the pier beyond the legal distance for casting out. Most appeared to prepared for a long day in the sun with comfortable chairs and cold beverages. I thought about the few times that I went fishing with my dad and wondered if the people who enjoy the sport grew up fishing with family. I was surprised to find sisters from my school at the very end of the pier. 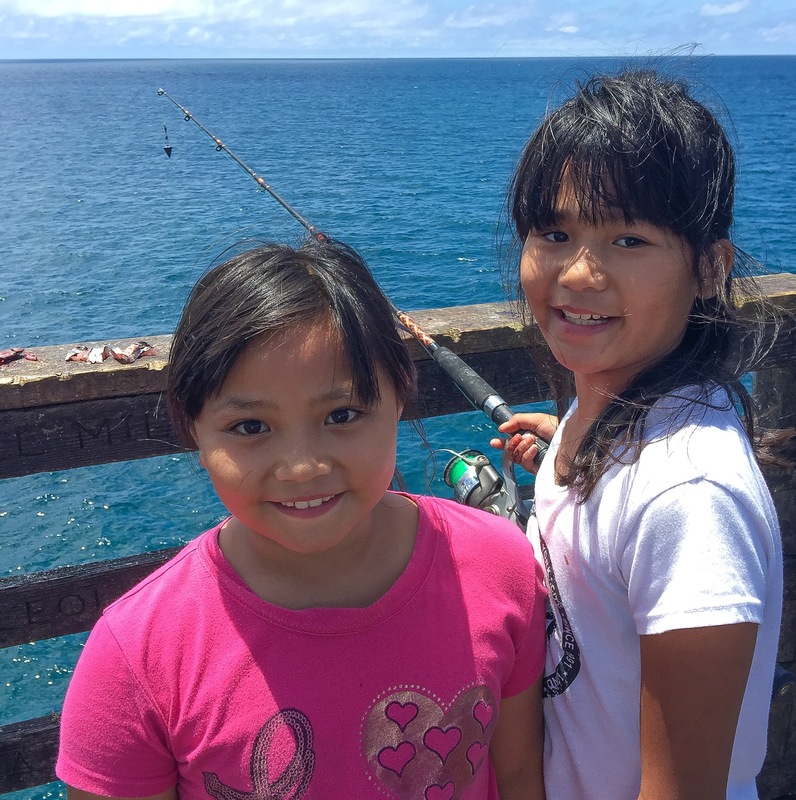 The 4th and 5th grade girls were baiting their hooks and managing their reels and poles with skill. They were excited to show me all the fish they had caught. I was happy to see them smiling and enjoying themselves because their father, who had been ill and in the hospital for months, passed away in the spring. They live with a guardian (who is not a relative) and a large extended family who loves them. I do not know why, but their mother has not been able to join them in the United States. They had to leave their mother behind in the Philippines after attending the service for their father. I remember their tears on their first day back at school when they returned. After we chatted, I gave them each a hug and wished them a happy rest of their summer. I continued thinking about them as I walked away. I wondered what more we could do to support them when they return to school in the fall. 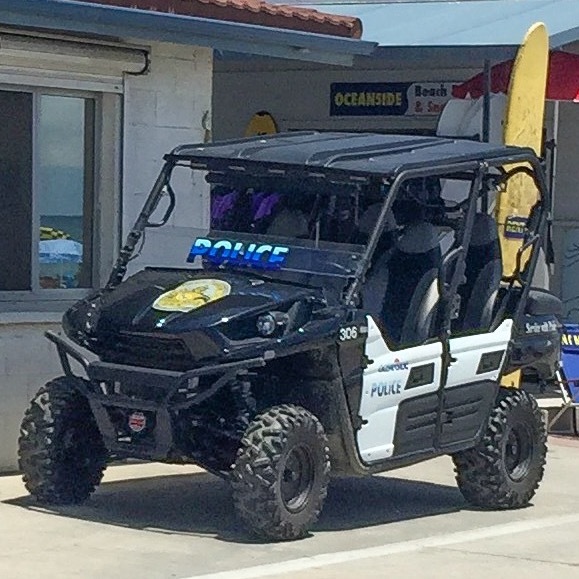 Before I headed to my car, I noticed the lifeguard station and an off-road Oceanside Police Department (OPD) vehicle equipped for the sand. The OPD logo reminded me of Officer Dan Bessant, a former student of mine killed in the line of duty blocks from the elementary school where I currently work by a young man who had attended the school and was remembered in the 5th grade as a quiet and respectful student. What went wrong in his life that he decided to commit such a horrible crime at such a young age? 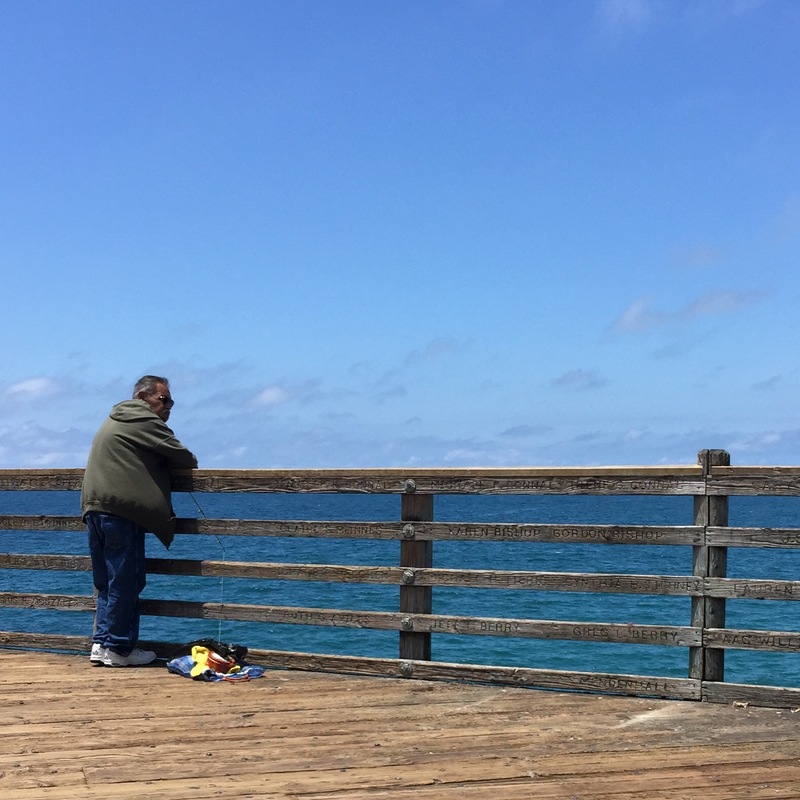 I realized that there are interesting, heart-breaking, and joyful lives behind every pair of eyes that look out toward the Pacific from the Oceanside Pier. The surf and the weather will eventually take their toll on the sturdy wooden structure, but I am certain that the next generation will rebuild it when the time comes, because the Pier is a unique public space that welcomes everyone. This entry was posted in Creating, Creativity, Education, Environment, Equity, Living, Photography, Teaching, Uncategorized, Writing. Bookmark the permalink. 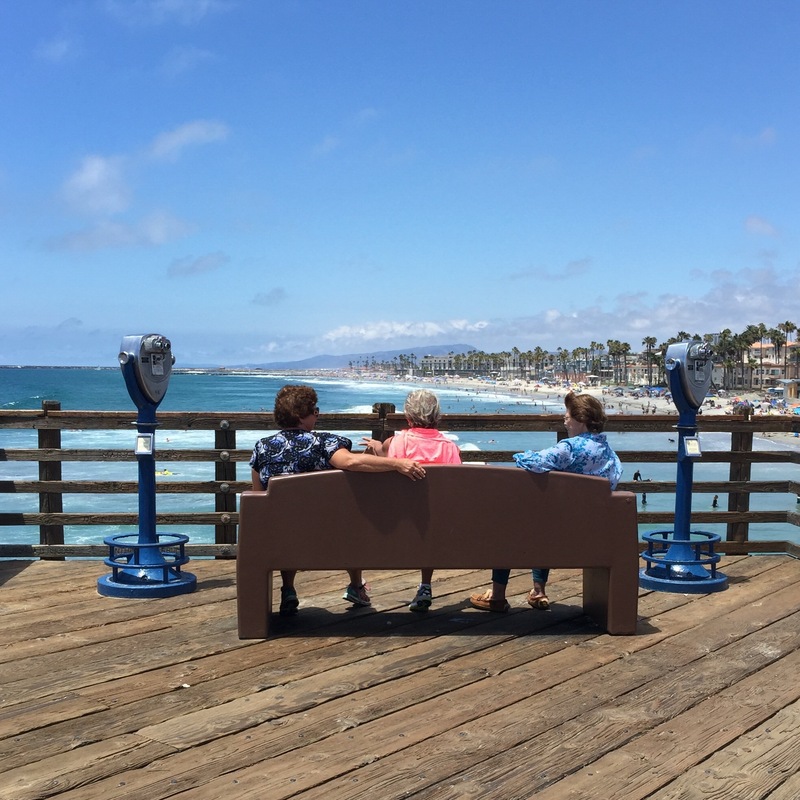 What a beautiful tribute to an amazing public place…definitely matches my experience with the pier. Such a contrast to the post I wrote today…and just a few miles apart! I enjoyed my walk along the pier with you.